Derived from the plant native to the Peruvian Amazon region, Inca Inchi Oil is a perfect balance of Omega 3, 6 and 9. Ideal for salads, smoothies or taken on its own as a food supplement. After extensively researching the fish oil industry where generally, 5kg of fish to is required to produce 1kg of a good quality omega 3 oil, Cyndi wanted to provide an organic, land based oil with the same nutritional profile that tasted good and didn’t need colours, flavours or deodorising. 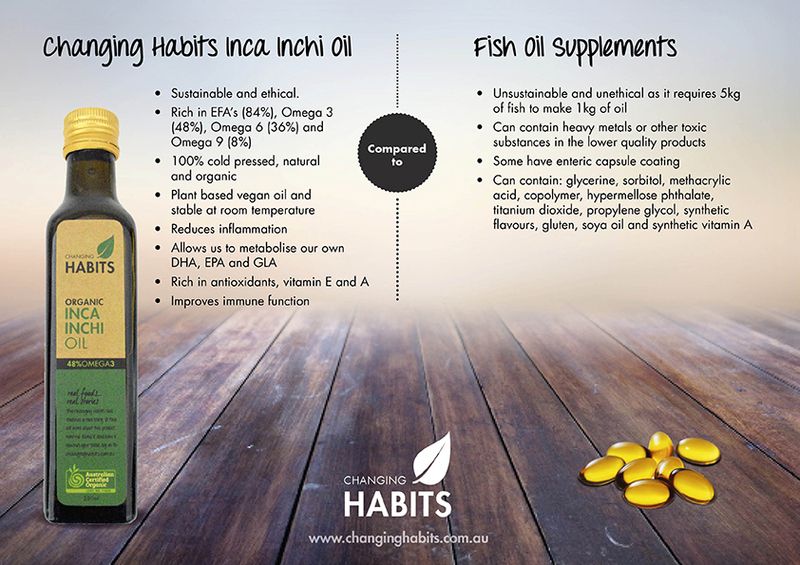 Unable to source a suitable oil within Australia, our beautiful Inca Inchi Oil is extracted from the inca inchi seed found in the Amazon rainforest and has 48% omega 3 and 84% essential fatty acids. A couple of years ago I started to look into the fish oil industry. Not only was I looking into how the oil was produced but what was added to the oil as well as how they made the gel caps and what flavourings and deodorises they used to disguise the taste. I remember as a young girl my Mum always gave me Cod Liver Oil by the spoon full for a daily tonic. I didn't like the taste and I certainly was not impressed with the after burps. The fish oil industry has evolved since the early days where young girls like me no longer need to taste the oil, because of the gel caps, flavours, sweeteners and colours. But hang on surely this can't be healthy. Can't we find a land based oil that tastes good, doesn't need colours, flavours and deodorising that doesn't need 5 kg of fish to produce 1 kg of a good quality omega 3 oil. I made up a spread sheet of all the plant based oils that I knew were available. I worked out their omega 3, omega 6's, their monounsaturated, polyunsaturated, saturated, essential oils etc. I felt there was no one oil that could take the place of fish oil, so I decided that if I mixed 4 oils together I could get the amount of omega 3 that could match fish oil. One of the oils was coconut oil, but to mix coconut oil with other oils that don't solidify in cooler temperatures means I may have needed an emulsifier. Then I was trolling the internet and learnt about the inca inchi seed from South America, I read up on the nutritional profile and was stunned to find that I had finally found an oil that fitted the profile of 48% omega 3 and 84% essential fatty acids. Bingo. Now all I had to do was source it locally. It was not possible there was no inca inchi in Australia. Finally, my husband Howard went to South America to source the best quality Inca Inchi Oil. Inca Inchi is a plant that is native to the Peruvian Amazon region. This oil is extracted from selected seeds of Plukenetia Volubilis Linneo. It is a truly natural, additive-free, non-refined vegetable oil. It is processed mechanically using techniques that do not alter the nature, nor the quality of the oil. It is considered the single richest vegetable source of essential fatty acids, including linoleic Omega 6 and alpha-linolenic Omega 3. The human body does not manufacture these fatty acids on its own, however, they are imperative to good health. Inca inchi oil is also high in anti-oxidants, including Vitamin A and Vitamin E. The structure of this oil aids in protecting the skin, hair and nails by limiting dehydration while it strengthens and builds up natural defenses to common external and dietary exposures. Inca inchi oil is an excellent ingredient to use in products designed to combat inflammation, irritation, dryness and damage. It is sustainable and in fact contributory to the social and economic wellbeing of the regions where the oil is manufactured. It is one of the most healthy oils on the planet and has all 8 factors of vitamin E, antioxidants and other nutritional factors which make it the premium oil of our time. This oil won gold medals at the European food fair in France for best new culinary oil. It’s mild nutty flavour is rapidly becoming a favourite amongst food lovers around the world. It can be used in much the same way as you would use extra virgin olive oil – in salad dressings, on vegetables, pasta, makes a beautiful mayonnaise, as a dipping sauce, with a vinaigrett or as a superior replacement for flax seed oil. The Inca inchi plant is a small one with small hermaphrodite flowers producing small pods (green at first and brown when ripe) which usually has 6 lobes. Each lobe contains a seed of 15-20mm width with an average weight of 1 gram. Inca inchi seeds are rich in nutrients and essential fatty acids, much more than other oilseed plants known. This plant is cultivated mainly in the district of Pichanaqui ( Junin - Peru) at the heart of the inca culture, because this land offers the best environmental conditions (the ground is soft and has a high content of minerals and some nutrients). This land is located at a high altitude - 500 meters above sea level - in the conjunction of the Andes and the Amazonian jungle. The place is protected from excessive rain, flooding and hard winds. Inca inchi was a wild plant but today it is grown in the Amazonian jungle. The Amazonian jungle is one of the most valuable in the world, it contains thousands of animal and vegetal species and it represents today more than one fifth of the world's fresh water reserves. The growing of the Inca inchi plant contributes to the economy and health of the local people. Inca Inchi oil is produced from the seeds of the plant. Seeds are selected and cold-pressed to get a virgin and natural oil. Inca inchi oil represents a source of precursor of Omega 3 (with an appropriate combination of omega 6 and 9). It allows humans to metabolize their own Omega 3 this fact makes Inca inchi oil a far superior product to the health (compared with other oils). Even fish oil has a lower content of Omegas and a higher percentage of saturated fatty acids - compared with Inca inchi oil. The statements contained herein have not been evaluated by the Food and Drug Administration. The information contained regarding this product is intended for education and information purposes only. This information is not intended to be used to diagnose, prescribe or replace medical care. The product described herein is not intended to treat, cure, diagnose, mitigate or prevent any disease. Please refer to our Disclaimer regarding our products.